Trade size edition. 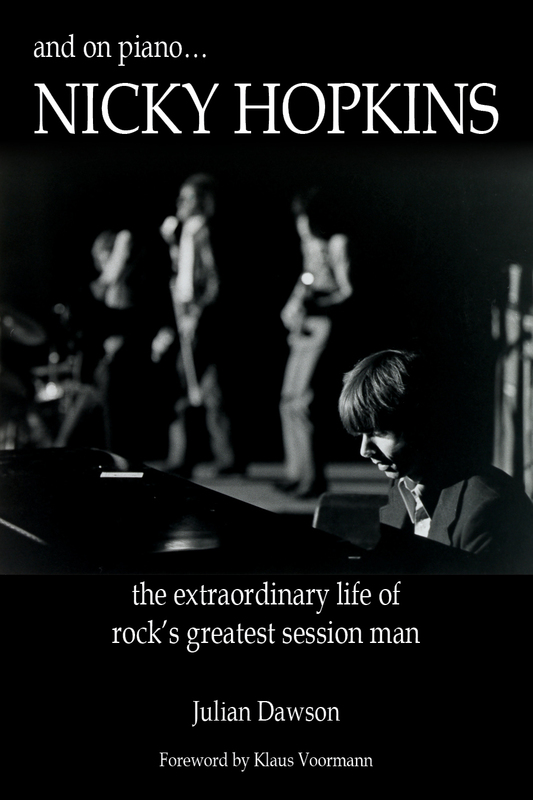 Introduction by Klaus Voormann, 6 page Introduction, 338 pages of text including-25 page Discography, 3 pages listing bands and live appearances, film and video appearances, plus an Index. There’s also many b&w photographs throughout the book beginning with Hopkins’ early life and the bands he played with. Sprinkled throughout are album covers of various pertinent sessions Hopkins played on, or his solo work. “Nicky could play anything. He was a genius.” Bill Wyman. “Nicky was a genius, but a lot of the time genius isn’t noticed until many years later.” Joe Cocker. “I wish he were here right now-it would be so great if he could just walk right out on the stage and sit down at the piano.” Steve Miller. “He was just a brilliant, brilliant musician!” Chuck Leavell. Session man Nicky Hopkins is, hopefully, known to just about anyone who has listened to The Who, Jeff Beck Group, Joe Cocker, The Kinks, The Yardbirds, Steve Miller Band, The Strawbs, John Lennon, The Beatles, Lowell George, Jefferson Airplane, Harry Nilsson, Quicksilver Messenger Service, The Creation, P.P. Arnold, Billy Nicholls, The Move, The Iveys/Badfinger, Giles, Giles and Fripp, The Easybeats, Dusty Springfield, Family, Jackie Lomax, Donovan, Rod Stewart, George Harrison, Jerry Garcia, Tomorrow, and many, many more. His unique abilities, both as a piano (and sometimes organ/harpsichord) player and an arranger, made him the “go to” guy for many bands of the era. No matter if it was a simple piano piece to flesh out a song, or to arrange a piece of music, Hopkins was the man for the job. Similar to many good guitarists, Hopkins had a recognizable sound whenever he sat behind the piano. His unmistakable sound graced many fine albums and individual songs. The author interviewed many people, including-P.P. Arnold, Long John Baldry, Ritchie Blackmore, Pete Brown, Vashti Bunyan, Joe Cocker, Dave Cousins, Spencer Davis, Gary Duncan, Al Kooper, Albert Lee, Nils Lofgren, Michael McDonald, Ian McLagan, Steve Miller, Andrew Loog Oldham, Graham Parker, Richard Perry, Prairie Prince, Keith Richards, Tom Rush, Brinsley Schwarz, Paul Samwell-Smith, Leigh Stephens, Rod Stewart, Shel Talmy, Mick Taylor, Richard Thompson, Joe Walsh, Bill Wyman, among many others-both well and relatively well known people in the music business. The various interviews were of varying length, but together they paint an in-depth portrait of both Hopkins and his music. Hopkins ability to constantly come up with just the right sound kept him busy throughout the late 60’s/early 70’s. There was talk from both The Who and The Rolling Stones about joining their respective bands-something he regretted later in life not doing. A busy session man, Hopkins was rarely paid commensurate with his abilities. He quit The Jeff Beck Group to play on a Stones record. He never kept track of his sessions, and never asked for a percentage instead of straight payment-huge mistakes. This was the era when session players were simply anonymous musicians, treated and payed with little regard for their talents. In the beginning Hopkins never really thought about, or knew, what top flight session musicians in the U.S. were payed for their contributions. This book, written by Julian Dawson, a friend later in life in Nashville, tells Hopkins story from his early days in England in the 1950’s, his discovery of r’n’r music, playing in bands like Screaming Lord Sutch, and Cyril Davies. But even during these early years of life, Hopkins suffered a debilitating intestinal problem (which would eventually contribute to his death), that left him in hospital, and off the scene, for extended periods of time. If you’ve ever seen a photograph of Hopkins you know what I’m talking about. While this book concentrates on Hopkins’ life, it’s also about the beginnings of r’n’r in England, and his subsequent playing with a number of the best bands on the S.F. scene, during the musical explosion of the late 60’s. Hopkins’ story is tied to the first stirrings of rock, blues, and r&b, that was played by a loose gathering of like-minded people. As Hopkins’ story unfolds, so does the story of this (then) new music, which was beginning to spread throughout England. In that respect this book is a window into this exciting era when groups were forming everywhere to play this new music. Likewise, Hopkins’ life in the burgeoning Bay Area music scene is recounted in some detail, with a good look into his playing with Quicksilver Messenger Service especially interesting. Hopkins was in the front ranks of British session players of the day, which included John Paul Jones, Jimmy Page, Clem Cattini, etc., and he was a favorite of producers like Glyn Johns and Andrew Loog Oldham, among others. But a move to the U.S. would change his life (ultimately) for the worse. Settling in the Bay Area of S.F., he played with a number of bands in the area. He also met a woman, Lynda Van Orden (Steve Miller-“the girlfriend from Hell”) who, in a nutshell, turned Hopkins’ life into a nightmare. The book details Hopkins slide into alcoholism (he previously wasn’t a drinker), and drug use-using a number of illicit substances. As a result his life would never be the same. And touring with The Stones in 1972, on their infamous trek across America, did nothing to help matters. After that tour Hopkins was literally a hollow shell of a man-unfit both mentally and physically. The book relates in Van Orden’s hold over Hopkins, and as a result Hopkins made a number of bad career decisions-not keeping an eye on his finances (which Van Orden spent), a disastrous solo career (even with many well known musicians on his recordings), Van Orden’s infidelities, and Hopkins’ increasing alcoholism. He also let Van Orden run his business affairs and her name appeared as a co-writer of some of his songs. To make matters even worse, Van Orden would attempt to sing-which was a disaster. Combining his personal and physical problems-Hopkins’ apparent inability to take charge of his career, join a band for the duration, front his own bands, and effectively play his own music, Hopkins’ life as a “name” musician was doomed. Van Orden was a strong personality where Hopkins’ was weak, which he apparently didn’t seem to mind, during their marriage-the music was all that really mattered to Hopkins. This is the period when the once top flight session player had to be strapped to his piano bench in order to play on sessions. But the book ends on a relatively high note. Hopkins found Scientology, and credits that with his recovery from drug addiction. Hopkins also married again, this time to someone who helped him though his troubles. But at this late date, his career as a session player for major artists was over – he became the band leader for Art Garfunkel. During this period he also wrote film scores for foreign films. But what Hopkins really wanted was to form a band with Joe Walsh and singer Frankie Miller. But Walsh upped and joined The Eagles, so it came to nothing. It seemed that Hopkins could never catch a break-which he deserved. In later years he regretted working for cash instead of a percentage, something which would have given him a relatively steady income for life. But without a composer’s credit, he lost all of it. His illness kept him from playing sessions and continued to hamper his life. And of course the decisions not to join major bands when asked was a disastrous one. Combine all that with his various personal problems and you have a portrait of someone who was unlucky in every sense of the word. Hopkins rubbed shoulders with some of the best musicians of the much vaunted 60’s. He also knew the harrowing lows of addiction, and physical maladies. But at least near the end of his life, having moved to Nashville, sober, and happily married, Hopkins lived out the rest of his days, dying in 1994. Hopkins career began as a footnote on the back of many fine albums of the era, he found relative fame, and then his life fell apart. Hopefully this book will keep him from, once again, becoming nothing more than a footnote in discographies to both current and future generations of music listeners. He stands alongside session players like Hal Blaine, Leland Sklar, and other studio musicians, in both L.A. and N.Y., and with Charlie McCoy and a select few in Nashville, who played on countless songs by both unknown and popular artists of the era. His playing style, his sensitiveness with a song, his very sound, was a major contribution to r’n’r. He deserves to be remembered.